Young adult and children’s books are a font of magical storytelling. Much of the stories are based on myth or made up worlds. There may be similarities to magical practices or beliefs in our ‘real’ world, but usually most of the story is a fantasy, pure and simple. And yet, when I read The Sea of Trolls by Nancy Farmer I was astounded at the depiction of magic. The bard teaches Jack about the Life Force, the current of energy that flows in the earth and is in abundance in certain places on the earth. Some places are so potent that it either makes you mad …. or a poet. Jack has to learn to feel the currents under his feet. Using this current he can call up a fog, or fire, or wind. We see the importance of storytelling, poetry, and song in both the Druidic context and from the Viking skald, who knows their location by tasting the sea water (for he knows all the currents of the North Sea). We also see the power of the stories we tell ourselves. Shapeshifting plays a role in the story. We see glimpses of folk magic. We see the toll that magic and trance can exact on humans. We learn about the virtues of bravery and loyalty. There is even some genderbending. The magic in the book is not based on spells or incantations (although stories can act like that). We see people digging deep into the wells of their own power and that of the Currents around them. We see them observing the land and all living creatures and drawing upon that knowledge. Many of the magical lessons, tools or skills employed or discussed in the story line up with my own experience, what I’ve been taught, or the stories I’ve heard from trusted sorcerers and witchy friends. This is the first book in a trilogy. While I enjoyed the entire series, this was by far the best of the three. It is a book that I’ve gifted others and one that I will gladly read to my kids many times. Here is a list – off the top of my head – of other magical books that I’ve read my son that I quite like: Horatio Happened by Kathryn Cave and Chris Riddell (for the very young), The Hounds of Morrigan by Pat O’Shea, Wind in the Willowsby Kenneth Grahame, and I look forward to starting The Hobbit soon. We also read a lot of myth and fairy tales. I have to admit that I may be one of the only people who doesn’t dig the Dark is Rising series – and I even read them while living in Wales. It’s Maxim Monday! And today’s is: control anger. On the surface, I think, yes, we absolutely need to control our anger. I’m raising small children. How many times a day can I say the following? Keep your hands to yourself. Use your words. How are you feeling? We don’t hit people. If you hit anybody in any way with that, I will take it away for the rest of the day. Please be in control of all your parts. You may not call me names. All of that is great advice for big or little people. We shouldn’t hit in anger or call people names. We should express our feelings verbally using I statements. We should be in control of all our parts (to my 4-year-old I mean arms, legs, feet, hands, etc; to grown ups I would say not just our body but all of our parts: brain, heart, and spirit, too). Being in control of anger doesn’t mean we don’t get angry, though. In fact, I think anger is a valuable emotion, especially for women and other marginalized people. Getting angry can provide us with powerful information: this hurts me, this situation is Not Good, I’ve been wronged, something needs to change. But for many women and many othered people there is a tendency for our experiences to be diminished – oh you’re making a big deal out of nothing, oh you’re just so emotional, get over it. So we learn to distrust our feelings. An angry woman is equated with a bitchy woman. An angry black woman gets pigeonholed as, well…. an angry black woman, the thought of which terrifies white society. But maybe black women have a ton of things to be angry about. Or a million people who want equal rights. Or hundreds of thousands of people who want economic or environmental justice. There are a LOT of reasons, personally private and broadly systemic, about which to be angry. The key is what do we do with that anger. At whom do we direct it? A lot of the time, in my own personal experience, it gets directed inward. Instead of expressing my anger out of a fear of not being taken seriously I learned to turn all that emotion inward and against myself. I felt hurt so I’LL SHOW YOU. Such an ugly root of perfectionism. I learned to be STILL when at my most angry, still like a coiled viper, or a cornered animal getting ready to pounce, claws out, waiting to draw first blood. Utterly unhealthy. I still don’t quite know what to do with my anger when I feel particularly ‘rage-y.’ I’m doing a better job than ever at not taking my emotions out on others. Nothing like parenting to highlight what areas need work. Many days, especially with a four-year old, controlling my anger is Life Lesson number 1. I’m learning more and more to use my words, to keep my hands to myself, to seek out healthy ways to channel righteous indignation when I feel it, not to call people names. 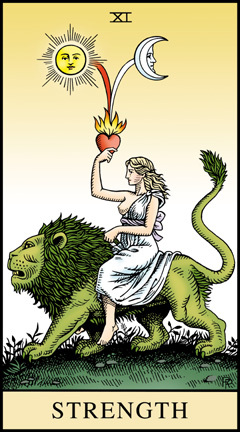 I’m learning to see anger as an ally, like the beast in the Strength card in tarot. Instead of feeling that it will devour me alive, I am riding it, learning from it, and yes, controlling it. Inspired by The Spell of the Sensuous I want to explore more personally what Land and Place mean to me. David Abram talks about geography as a container. More than just mountains that enclose or fields that spread out, land shapes our views of the world, our experiences with future places, how we perceive time and seasons, how communities function, and how we relate the non-human world. I see this so clearly from my own upbringing in Juneau, Alaska. It has so profoundly shaped me that, even though I’ve not lived there for a decade, I still consider myself an Alaskan first – even before being an American. My friend Jennie came to visit from Seattle. She thought having an actual end of the road was hilarious. 1994. Juneau is small-ish in population, but spread out over a 50 mile strip of land, clinging to 3- and 4,000 feet tall mountains, hemmed in by glaciers and water ways. You cannot drive in or out. It sits in a fjord, in one of North America’s largest, oldest rain forests. Black bears in your backyard, deer eating your garden flowers (that bloom for about 6 weeks), porcupine, whales, bald eagles, ravens larger than any I’ve ever seen elsewhere…. all normal inhabitants. How did these things affect me? The mountains and water, the ice fields and forests helped me feel safe. Of course, you could die if you hiked off trail or went boating in bad weather. I went on one epic hike when I was 18, a hike that was supposed to be about 9 or 10 hours (from Sheep Creek up and over the ridge and down Mount Roberts). It ended up taking us 18 hours. I nearly slid off one of the peaks into a gully from 5,000 feet. It’s not a gentle landscape! And yet…. I felt, still feel, that with proper respect (which includes preparation) I was safer there than in most other parts of the world. A picture I took of my dad in 1987. 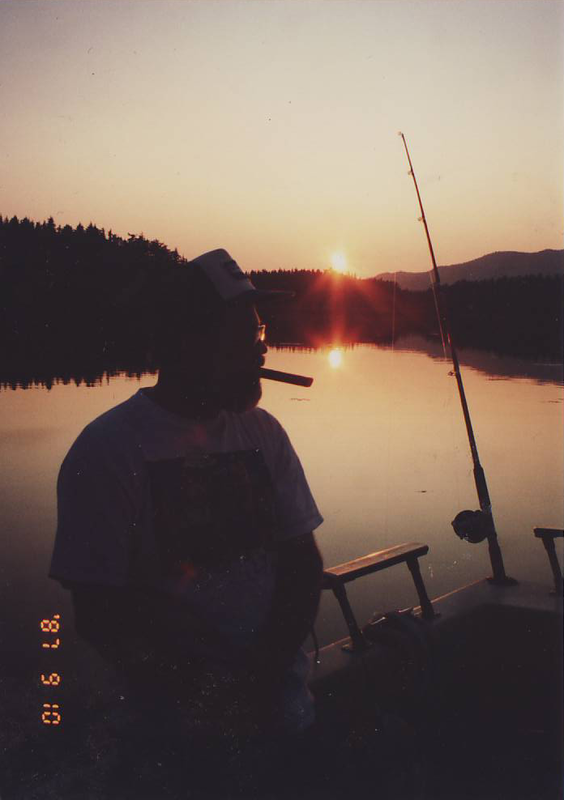 On our boat somewhere in SE Alaska, fishing at sunset. When I left Alaska for college I couldn’t wrap my head around how it was possible to cross a street and be in a different town. It took me many years to understand that. Perhaps this is why maps and geography are so important to me. I want to know the shapes and boundaries of towns. I felt something divine in the land. I was a Christian in my teen years, and yet I still felt God’s existence and presence in the land around me. It wasn’t just an idea that God had made the land, but more that the land was an expression of God and he comforted me and spoke to me through the land itself. I’m not sure I could have articulated that then. I grew up around people that used the land. They used it to feed their families; they used it for their occupation. By ‘using’ I mean, they worked with the land. The men and women I grew up around knew that the land was the source of their livelihood, whether that was building infrastructure during the opening of ANWR and the pipeline in the late ’70s, or working as fishermen. The land provided….. and the land, if not worked with, if not respected, could take away as well. There is no power over the land in Alaska, only power with. 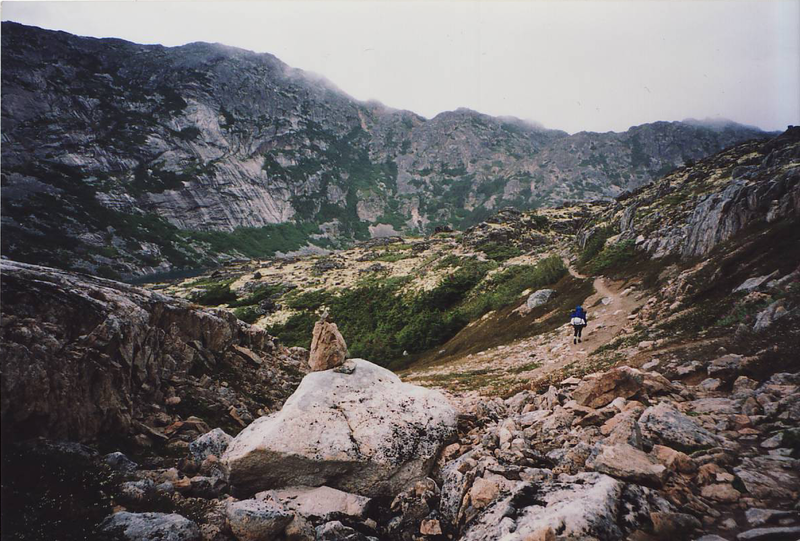 Me, hiking the Chilkoot Trail between Skagway, AK, and the Yukon, Canada. Most people take a week to do this. My crew did it in less than 3 days. Not sure that was wise… 1999 (I think). In fact, that’s one of the things that amused me when I lived in Wales – there was nothing that could kill you in the land. Sure, you could get too drunk and fall off a cliff. But the weather is generally mild and none fo the animals were predators of humans. If you got lost on a hike or walk, just keep going and you’ll hit some one’s farm. Get lost in Alaska and no one will see you again. Our friend Tim (may he be at peace) took this of me and Jennie. He led us hiking under the Mendenhall Glacier. 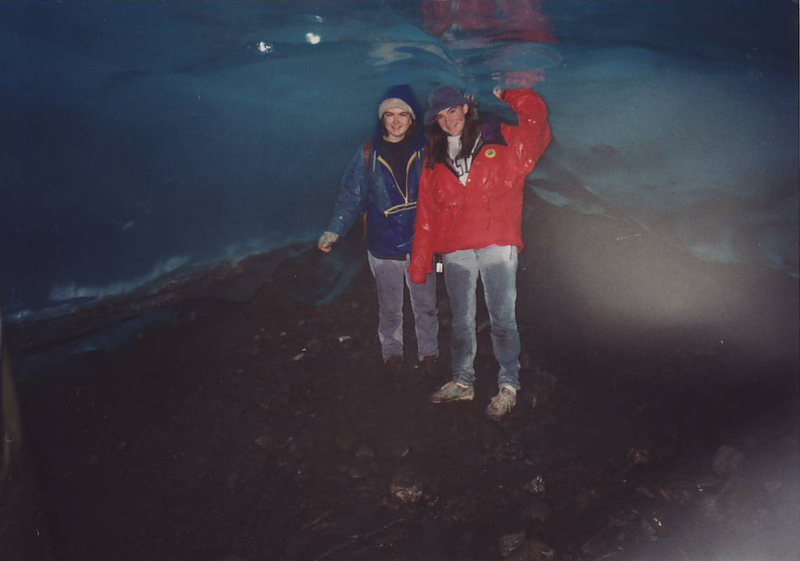 This part of the glacier has since melted far away. 1995. Something else that has affected me my entire life is the disparity of light in the seasons. I never suffered seasonal affective disorder, though I know many people who do, who have, or have some variation of it. We have 18 hour days in the summer with extended twilight; 18 hour nights in the winter. Until only recently I’ve always felt that the days were never long enough in June, never dark enough in December. This was especially hard for me when I lived in California. It rains so much in SE Alaska that autumn is truly only 10 days at the end of August. Spring is about 2 weeks at the end of May or early June. October was always my least favorite month. It wasn’t until I lived in Washington that I learned that October is AMAZING. It is now my favorite month. Perhaps this is why fall is now my favorite season. Autumn makes me giddy! Spring is also a joyous surprise every year. Grow up with only two seasons, and the 4 season climate is something of a revelation. Each year I get two extra seasons! It’s like nature gives me a present every three months! Light, dark, rain, water, fish, mountains…. I was in love with my Land. In fact, for over a decade I felt like I was in an adulterous relationship. Alaska was my lover and I was cheating every time I flew to Washington to start another year of college. I was cheating when I moved to grad school in Berkeley. I figured Alaska was my childhood sweetheart and I’d be back when I was ready to settle down. I always, always intended to return. 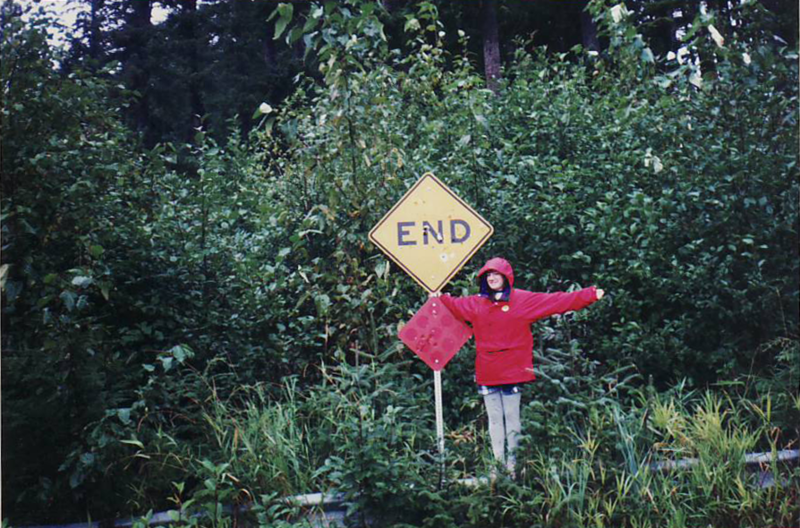 Me visiting Juneau in March 2004. 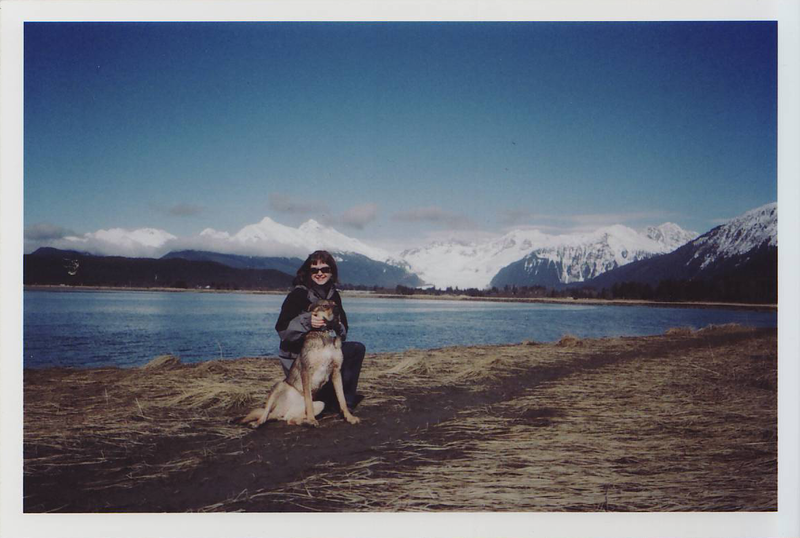 Mendenhall Wetlands and my then dog, Dawson, named after the town in the Yukon. This rather dysfunctional relationship with my Land, as foundational and beautiful as it was to me, also kept me from diving deep into other lands and places. It took me a long time to settle into the Bay Area, into Washington. The only places that were never a struggle for me were Ireland and Wales. If I’m honest, that separation from Alaska made me feel broken. What was wrong with me that I couldn’t adjust to other places? Why was I so overwhelmed in cities? I did just fine on an intellectual level: I loved the energy, the opportunities, the food, the excitement. But at a core level, I was so deeply overwhelmed, like there were was too much buzzing, too much noise, too MUCH all the time. Why did I need trees the way most people need food? No one else I knew (other than people from Juneau) wanted to return to their home towns. Everyone wanted to flee. Why was I unable to function in cities? I felt like I was failing as an adult. It’s not something I ever really talked about, but I felt it. My two-week vacations home once a year were not feeding my soul. I needed to break up with Alaska. Moving to Wales, not moving back to Alaska, was a good first step. And finally, at some point while there I realized that Alaska was a part of me and I took my Land with me where ever I went. I may have to spend the next 25 years working to know the land I’ve chosen as home now, but it’s possible. I no longer feel broken. I feel full and blessed to have been given the gift of Place and Land in a way that seems rare these days. It’s Maxim Monday! Now featuring a post on a parenting. This doesn’t sound like spiritual advice to me. It sounds like standard human behaviour. Help your friends. Of course. But at its core this is what community is about, and community, in my mind, is a spiritual value. As the parent of two young children (4 and 19 months) and as a stay at home mom, I see the priceless value in helping and being helped. I try to keep politics off this blog, but as I am a woman, everything I do, say and think is political. (Which gives you some ideas as to my politics.) As a parent I also feel politicized. Allow me a little wiggle room to wax political; it relates to today’s maxim. The nuclear family is a myth and a lie. So is the ‘family values’ movement (particularly here in the US). Nothing about our lifestyles and society actually supports families, and may all the gods help you if you are disabled, care for some one with special needs, are middle class or ‘lower’, are a single parent, queer parent, non-traditional parent (polyamorous or perhaps grandparents raising children), not white, have limited English, etc. The mainstream model of a family is a unit that owns a house, at least one parent works and the (usually) mother stays home, or both parents work and make enough to afford a house and daycare. What it does is alienate people from avenues of support: mainly other people. I am so very grateful that my family has been able to configure our life as we have. Adam works from home and I run the household: I plan and cook all the meals, do all the laundry, do 90% of the cleaning, and 80% of the childcare. It’s an even trade. I’m very happy. But I also get adult conversation throughout the day. We all eat lunch together and talk about what we’ve been thinking about or working on. We own one car and that allows me to get out with the kids. But for all of that, it’s still isolating and often boring. Profoundly boring. I used to be a professional! I was a PhD student! And now I read ‘Where is the green sheep?’ three times in a row, wipe butts, and get told I’m stinky because I won’t let the boy watch ANOTHER cartoon. I’m not alone in this. 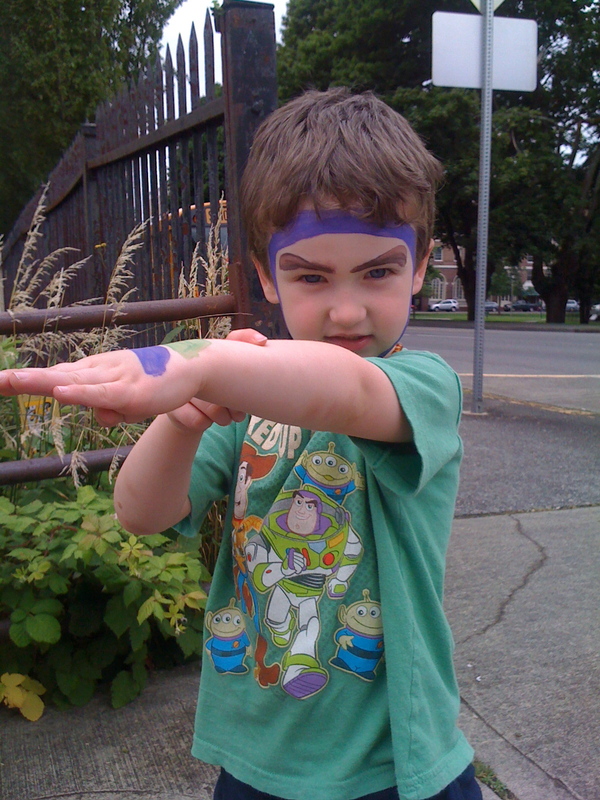 There are many trials and tribulations in parenting, and we willingly take them on. But I get a sense that this is not the way humans have been parenting for the vast majority of existence. (Ok, I know for a fact, since I read some books, but I can’t remember the details nor the books to cite, so I’m just leaving it alone for now.) I don’t think every parent of small children is supposed to be a preschool teacher. I think kids need a lot of stimulation and movement, snuggles and interaction – but not all from one person. I really think that communal living is what is supposed to happen. So when a friend asks me for a small and easy favor, something she needs to care for her family, of course I say yes. I help my friend. I want to help my friend. I’m in a good place right now, I don’t need much in the way of help, but I have in the past, I probably will again. It’s absolutely enlightened self-interest; it’s also putting my spiritual values into action – it’s walking my talk. It’s helping my friends. It’s creating the community I want to live in. In addition to being fed the myth of the nuclear family we are told not to ask for help. That it’s weak. That you need to do it all yourself. Don’t rely on others. And that is the biggest lie of them all. OF COURSE WE NEED OTHERS. Sometimes I need help when we move. Sometimes my partner has an important project and I need someone to watch the kids while I go to an appointment. Sometimes I just want a friend to listen. Sometimes I want some one else to cook. So we help each other. We listen, we love, we laugh together. I loan my neighbor all the cloth diapers I don’t need for her soon-to-be-arriving newborn. I host a weekly dinner with another family, when her husband works late. It’s doing a better job at organizing play dates so the kids and my fellow parents can betogether. It’s donating to charities. It’s picking up a friend’s kids from preschool when she’s running late. It’s helping my friends. It’s being in community.